Please contact us if you need a trial license key to evaluate the features in 232key Plus. We also regularly publish trial license keys in our newsletter. 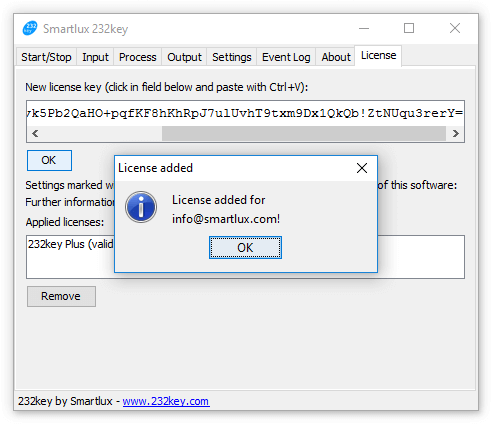 232key Plus is currently available for US$ 30 (plus VAT or sales tax, where applicable; volume pricing available) for a perpetual license with 2 years of free updates. 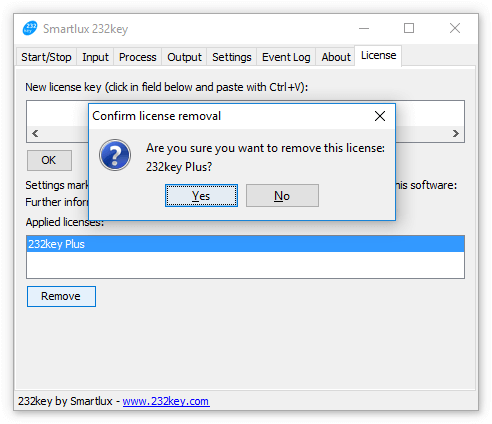 This means that your license will never expire and that all future versions of 232key Plus will be available to you at no additional cost for two years. Your license key and invoice will be generated immediately as soon as your payment is completed. You cannot right-click in the field to paste the key, please use the keyboard shortcut Ctrl+V. All Plus features described above will be enabled immediately. Please contact us to discuss discounts for significantly larger orders. Then, simply enter your original license key on a different PC to activate the Plus features.